Agent Tubrug1 recently wrote an article for TheMittani.com about awoxing in highsec. Though often misunderstood by the corpmates who get killed by them, the awoxer is a good and decent citizen of highsec. 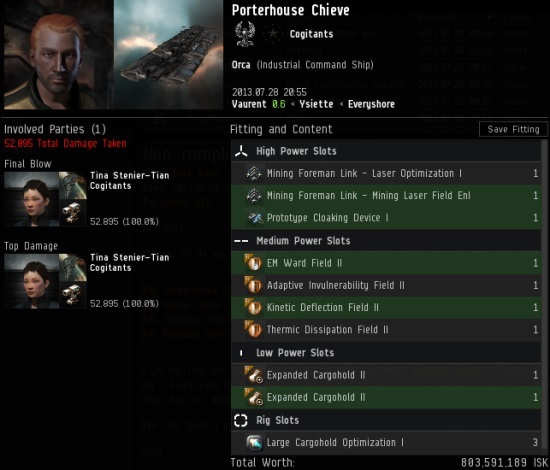 If you have a spare character or account, it's never a bad idea to take advantage of the fact that you can kill and pod members of your own corp in highsec without Concord interference. Sara's alt joined a corp called Cogitants and was gobsmacked by their flagrant disregard for the New Order's authority. 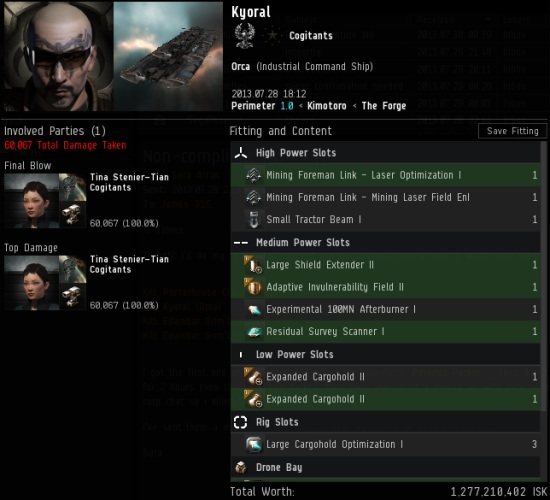 Sara's alt slipped into a Brutix and killed one of their Orcas, worth 1.2 billion isk. I'm particularly pleased by this kill because it took place in the Perimeter system, which is 1.0 security. Some people assume that 1.0 systems are 100% safe, and that killings are forbidden there. But remember, every system with a security of 0.5 or above is New Order territory. The Brutix brutalized another deserving Orca pilot in the corp that day. How did this happen? Well, for some reason, the corp called a mining op a couple hours after the first Orca got awoxed. Are there no limits to the greed and bot-aspirancy of the highsec carebears? They were in such a hurry to mine more stuff that they completely neglected to deal with the awoxer in their midst. The second Orca to die that day was equipped with a cloaking device, yet we know there is no hiding from the long arm of New Order justice. Some would call awoxing an act of treachery, betrayal, or deception. I call it an intervention. If you're addicted to self-destructive behavior, aren't you more likely to change your ways when confronted by a friend? That's what awoxers do. They make friends very quickly and then confront them. A lovely story of frindship...sometimes lessons are hard to swallow, but you must accept them. Only true friends are capable of doing what they must to save a friend in need, no matter the cost. It was great work! I remember seeing the drama unfold on the BU channel that day. Glad to see you get the recognition for your code enforcement efforts you deserve!